This is my newly built rail in the backyard. Initially, I have zero knowledge about model trains. I built this rail in 1 month after calling dealers asking for questions as well as learning from mylargescale forums. 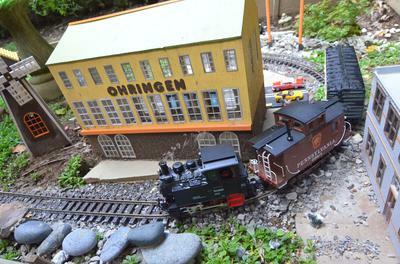 This rail is very small, the diameter is slightly smaller than 4 feet, thus, I used only small locomotives. All the plants are real. Join in and write your own page! It's easy to do. How? Simply click here to return to Showcase.